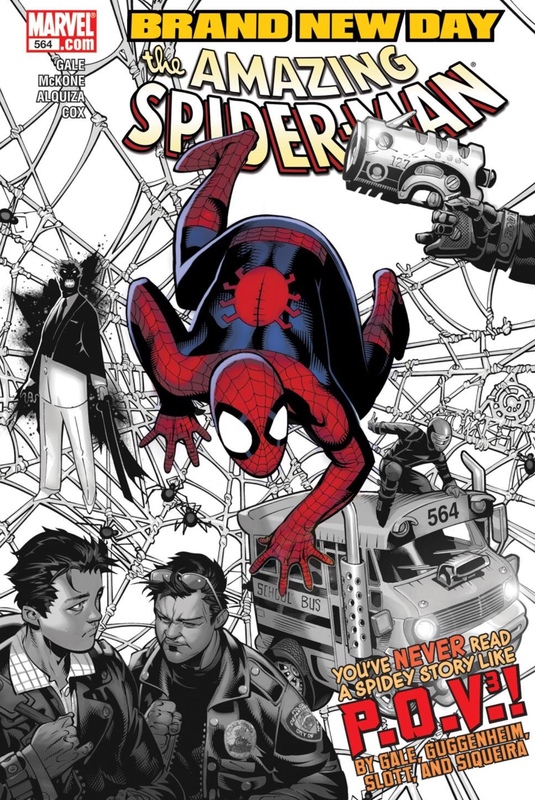 In addition to completely upending the Amazing Spider-Man status quo by mystically dissolving the marriage of Peter Parker and Mary Jane, what I think I best remember the “Brand New Day” era of Spider-Man for was the number of new villains introduced by the rotating team of Spidey scribes. It was clear that Marvel’s Spider office wanted to start fresh with their premiere web slinging hero, and considering how ASM was publishing three times a month during this period, it also made sense to give him some new villains to take care of. So old stalwarts like Doc Ock and the Lizard were temporarily tabled in favor of rogues like Mister Negative, Menace and Massacre. 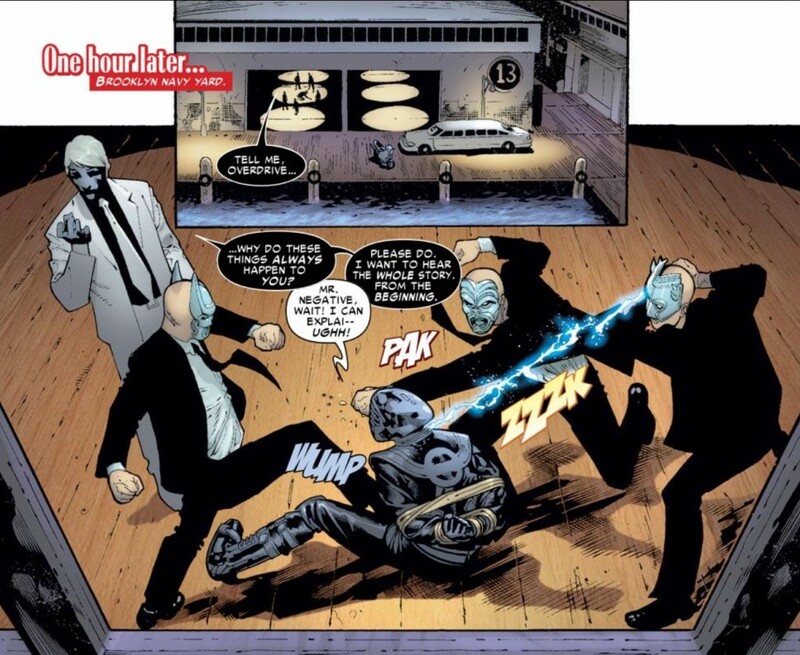 And if you blinked long enough, you might have missed one sort of experimental style issue in Amazing Spider-Man #564, which prominently featured Superior Foes of Spider-Man cast member Overdrive. Overdrive, who had been introduced earlier by Dan Slott as part of the 2007 Free Comic Book Day issue of ASM (it continues to amaze me how Marvel and Slott have consistently delivered in their FCBD Spidey stories in terms of legitimate content for a giveaway comic), makes his second appearance in ASM #564 in a story that goes off the beaten path by exploring three different character perspectives as part of its narrative. There’s the standard Spider-Man POV, but that eventually gives way to Vin Gonzales, Peter’s roommate and a police officer whose defining trait is he thinks Spidey is a villain, before eventually ending with Mister Negative’s perspective. 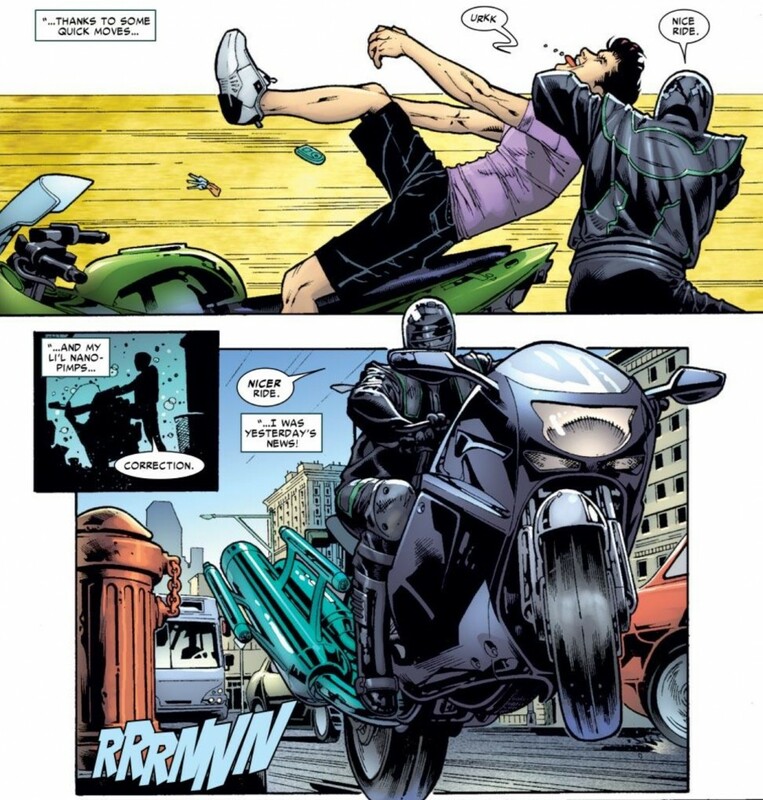 In order to give these different POVs so additional distinction, the writing duties on this comic are actually split three-ways among Marc Guggenheim, Bob Gale and Slott. Whenever you get multiple creators together to converge on a single narrative (even one told from multiple perspectives), I feel the comic runs the risk of being spoiled from “too many cooks in the kitchen” syndrome. But in yet another example of how underrated the “BND” era was in Spidey-history (and let’s be honest, the only reason people hate it is because of the silly editorial mandate that predicated it), these three different styles and voices come together fairly seamlessly to tell a comic that’s undoubtedly just holding the fort down in the ASM world until bigger storylines come afterwards. In other words, ASM #564 won’t get mistaken as one of the best issues from the BND run, but in terms of doing something a little bit different for a change of pace, it passes all tests and is definitely an enjoyable read. But what about Overdrive? It’s funny, despite the fact that the female Beetle was an entirely brand new character that I knew nothing about, when Marvel first announced that Superior Foes of Spider-Man was launching last year, the villain I was most non-plussed by was Overdrive. I actually had to remind myself that this guy had first popped up during BND, and making my memory even more foggy was his involvement in the FCBD issue (while we’re on the topic, anybody is anyone representing the collector police going to tell me that Free Comic Book Day issues need to count as part of my complete run of ASM? If so, then I’m definitely missing a couple of these as I don’t even think I had an LCS near me that participated in FCBD in 2007). And a major reason why Overdrive was so hard for me to remember was because the character primarily depicted as a loser in this storyline. Similar to those Bronze Age Bums I mentioned in my Speed Demon write-up last week, there is nothing remotely threatening about Overdrive. 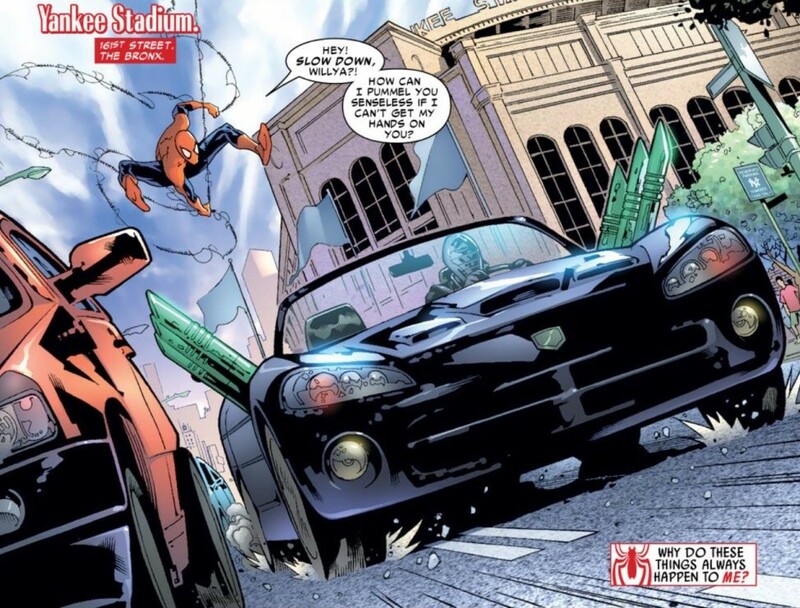 He has an interesting power – he can trick out any vehicle he gets his hands on – and even Spider-Man admits as much, but these are gimmicks, not well thought out characteristics. Once you take the gimmick away from Overdrive, he’s just another goon in a racecar helmet. Not to mention he ends the issue stuffed into the back of a car (that he does transform into a getaway vehicle). The actual threat in this comic is the mob boss Mister Negative, a guy who really hasn’t factored into Spider-lore since the underrated Cloak and Dagger Spider Island miniseries from 2011. Granted, the world of superhero comic books is chock full of one-note villains like Overdrive who are present more for comic relief than anything else (because it’s definitely satisfying to every once in a while see the hero take care of the bad guy without breaking a sweat – that’s what made Shocker so much fun in Ultimate Spider-Man). But it still took me by surprise when he showed up in Superior Foes of Spider-Man because after this issue, there was very little for a reader to hang there hat on when it came to Overdrive. He’s just another guy. Fortunately, Superior Foes creators Nick Spencer and Steve Lieber have done a magical job evolving Overdrive as a character. So much so that his actual gimmick isn’t even a true talking point in the series until a handful of issues in. Once Superior Foes wraps later this month, I’ll be quite curious to see where Marvel goes with Overdrive next – he at least warrants some more appearances in the main Spidey book (perhaps in tandem with Beetle). If that’s the case, hopefully he doesn’t leave his current characterization in the trunk of a car. Overdrive also made an appearance in a pretty cool issue of Black Panther during the Spider-Island event. 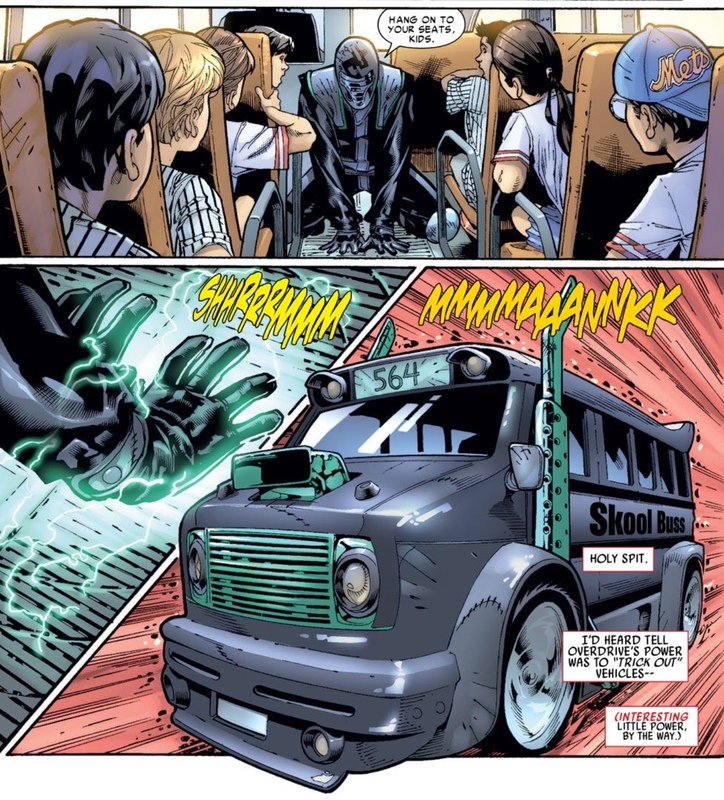 In that issue, his driving skills were put on display as he drove right through the middle of Shadowland with the Hand, Lady Bullseye and Black Panther all gunning for him.